Commander Alexander C. Grant joined the Canadian Forces in 1981 as an Officer Cadet at Collège Militaire Royal de St-Jean, QC. He later transferred to Royal Roads Military College in Victoria, BC, where he graduated in 1986 with a Bachelor’s Degree in Physics and Oceanography and accepted his commission as a MARS Officer. In 2004, he commenced his studies at the Naval Staff College Course at the Naval War College, Newport, Rhode Island. During this year long posting, Commander Grant earned a Diploma in National Security, Strategy and Policy, and Joint Military Operations. 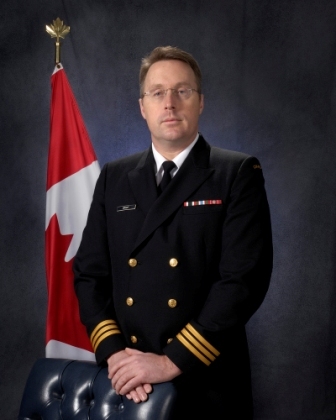 In 2005, Commander Grant returned to Canada and joined HMCS Athabaskan (DDG 282) as Executive Officer. While serving in Athabaskan as Executive Officer, the ship served as both Commander Canadian Fleet Atlantic and Commander Standing NATO Maritime Group One’s flag ship respectively during OP Unison, Canada’s contribution to the Hurricane Katrina relief effort and a six month NATO deployment, OP Sextant. Following his posting as Executive Officer, Commander Grant was promoted to his present rank and assigned to Maritime Forces Atlantic Headquarters as the Deputy Chief of Staff Surface Operations. In February 2008 Commander Grant took command of the frigate HMCS Toronto. During his tenure in command he deployed twice to the Canadian Arctic as part of OPERATION NANOOK. Commander Grant is married with two children.